What is the oldest Chinatown in the world? Because of Philippines’ proximity to China, it is not a surprise that it is in Manila: Binondo, which was established in 1594. This shows that that the Chinese presence and influence in the Philippines have been around for a long time. In Chicagoland, the Binondo state of mind is epitomized by Cid’s Ma Mon Luk Restaurant, which serves the ultimate Chinese-Filipino comfort foods: mami (Chinese dish consisting mainly of noodles with condiments and broth) and siopao (steamed rice bun with meat and condiments inside). Cid’s Ma Mon Luk Restaurant was named after Ma Mon Luk, a popular restaurant in Manila known for its mami and siopao. The original owner’s first name is Cid, thus the name. “The name is a touch of genius!” exclaims Rosa Ang Sanchez, who is the present owner. “Ma Mon Luk is a magic word in Chinese-Filipino cuisine. Filipinos instantly know that we serve mami and siopao.” This is, however. only a come-on. A wide range of delectable dishes is offered, making Cid’s Ma Mon Luk a must-visit restaurant. Sanchez, a business-administration graduate of Santa Isabel College in Manila, never thought she would be involved in the restaurant industry. She worked in her family’s paper-supply company and a travel agency. 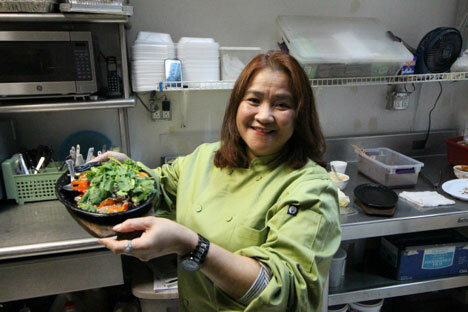 When she moved to Chicagoland, she started as a server at Cid’s Ma Mon Luk Restaurant. She must have been having a ball that she stayed on to eventually become the owner. Sanchez is grateful to Chef Cecilia Icasas Fernandez, for her masterpieces in the kitchen. They have worked together for many years that their relationship is almost like they are sisters. Fernandez had an early training in cooking. Growing up in Silang, Cavite, her mother, Yolanda Cabellon Icasas, taught her how to cook. “It was a natural thing to do,” she reminisces, “because we had a food stand that catered to tricycle and jeepney drivers.” Their customers were mostly male, and they learned to please their humongous appetites. Because customers were always rushing, Fernandez also learned to cook at fast pace. So, it was a cinch when she became a chef at Cid’s Ma Mon Luk Restaurant. “I virtually do a one-on-one cooking here. I know most of the customers,” she tells me. What makes a good chef? “Attention to details is important,” she answers, “especially when it comes to ingredients. And it doesn’t hurt to have a cheerful attitude when cooking because it might add zest to the food!” She learned to cook on the job. As such, she usually uses her instinct. She just knows when the taste of a food is right. According to Fernandez, customers also clamor for fried pusit (squid), lomi (thick fresh-egg noodles soaked with corn starch for more texture), and beef kaldereta (stew). She is always wearing a smile, and I am sure customers smile, too, the moment they taste her culinary delights! Pinays rule! Owner Rosa Ang Sanchez and Chef Cecilia Icasas Fernandez’s partnership has put Cid’s Ma Mon Luk Restaurant on the culinary map. It has not only become a haven for food lovers, but also a source of joy for the whole world!